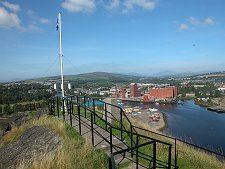 South of the centre of Dumbarton rises the 240ft high twin peaked volcanic plug of Dumbarton Rock, with the River Clyde on one side and the River Leven on two more. The Britons had a fortress here before the Romans left these shores, and it was still home to a military base as recently as World War II: a continuity of use of over 1,500 years. 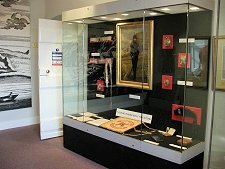 There are three things you need to know before visiting Dumbarton Castle. The first is that you will need to climb large numbers of steps in order to get anywhere at all on the rock. 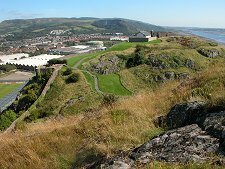 The second is that there have been three quite different stages of development on Dumbarton Rock, and what you see today is mostly only the most recent phase, which swept away much of what had preceded it. 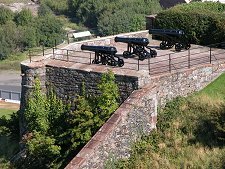 And the third is that though a visit may leave you wondering whether Dumbarton Castle really is a castle in any traditional sense, it is a fascinating experience, and well worth making a detour to see. The presence of a settlement here is first recorded in a letter St Patrick wrote to King Ceretic, the British King of Strathclyde at Alcluith (or Clyde Rock) in about AD450. In it he complained about a raid the Britons had made on his Irish converts. This date is supported by archeological evidence (fragments of wine amphoras) that suggest that the residents of Dumbarton Rock traded with the Romans, possibly before their departure from Britain in AD367 (see our Historical Timeline). The Dark Age history of Alcluith is unclear, though the King of the Britons of Strathclyde the 570s was Rhydderch Hael, who features in Norse legends. It is said that during his reign Merlin stayed at Alcluith. 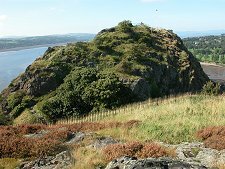 Two centuries later, in 756, the first (and second) losses of Dumbarton Rock were recorded. A joint force of Picts and Northumbrians captured Alcluith after a siege, only to lose it again a few days later. And in 780 Alcluith was burned down: who by, and why, is unclear. By 870 Dumbarton Rock was home to a tightly packed British settlement that served as a fortress and as the capital of Strathclyde. Buildings would have occupied every even vaguely flat space on the rock. But then the Vikings attacked: Ivar Beinlaus en route from capturing York, and Olaf the White from Ireland. They besieged Alcluith for 15 weeks before destroying it, carrying the loot and the survivors off as slaves to Ireland in a fleet of 200 longships. The Kingdom of Strathclyde remained a separate force in Scottish history until 1018, when Malcolm II incorporated it following his defeat of the Northumbrians at the Battle of Carham. This ended the first of the three phases of development on Dumbarton Rock and signalled the start of the second. By 1222 there was reference to a "new castle" built here. Dumbarton at the time had great strategic significance because much of the west of Scotland was under the control of the King of Norway, including the islands of Arran and, intermittently, Bute in the Clyde Estuary. The defeat of King Håkon IV of Norway by Alexander III (and by the weather) at the Battle of Largs in 1263 meant Dumbarton was no longer an outpost on a warring frontier, but it remained central to Scottish history over the following centuries. 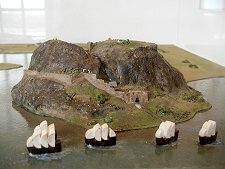 Very little is know about the way Dumbarton Castle evolved over the period between 1200 and 1600. It certainly looked more like a traditional castle, with extensive development on "The Beak" the flatter more easterly summit, as well as across the gap between the peaks and down the steep slope on the Clyde side of the rock. It also had two gates. One faced the River Clyde as it does today, the other, the North Entry, faced the town of Dumbarton. Only two of the surviving structures date back to this period. The Portcullis Arch above the Guard House was built in the 1300s, and the Guard House itself dates back to about 1580. 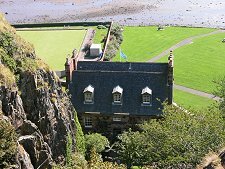 During this middle phase of its life, Dumbarton Castle served as a royal castle, a place of sanctuary in times of trouble, and a convenient place to keep prisoners secure. It also saw far more than its share of action. King David II sought refuge at Dumbarton in 1333 after the Scots lost the Battle of Haildon Hill, and sailed from here to France. In 1435 James I's daughter also went to France from here to marry Louis, the heir to the French throne. In 1489 James IV besieged the castle twice to suppress a rebellion by Lord Darnley. The great gun Mons Meg was used in the second, successful, siege. In the turbulence following the Battle of Flodden, Dumbarton Castle was captured in 1514 by the Earl of Lennox, who burrowed under the North Gate under cover of a stormy night. 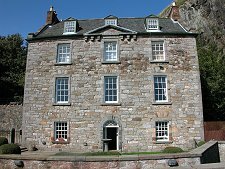 In 1523 the Castle was briefly garrisoned with French troops by the Duke of Albany, though by 1530 it was held by James V. In 1545 Dumbarton was captured on behalf of the child Mary Queen of Scots, who came here for safety in 1548 before sailing for France. She next visited Dumbarton Castle after her return to Scotland, 13 years later. In 1568, she was moving towards Dumbarton Castle after her escape from Lochleven Castle when her forces were intercepted and defeated at the Battle of Langside. Mary then fled to England and captivity, never to return. 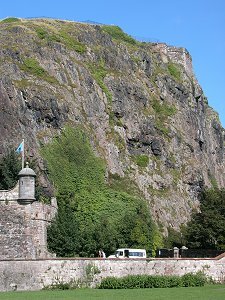 But Mary's supporters in Scotland were still active and still held Dumbarton Castle. On 1 May 1571 troops under the command of a Captain Crawford captured the castle after climbing the cliffs on the north side of The Beak in darkness, and Mary's remaining supporters in the west of Scotland either fled or were killed. 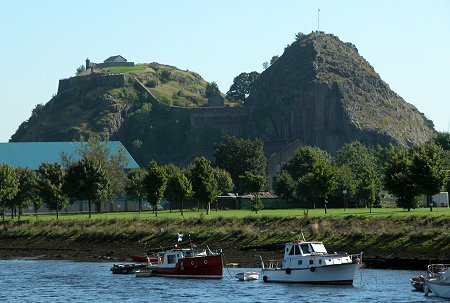 Dumbarton Castle's third phase of development followed a period of decline and disrepair. 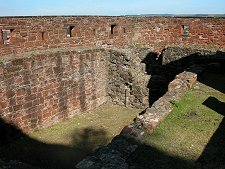 It was considered incapable of being defended by the time of Cromwell's arrival in 1652, and surrendered without a fight. Over the period from 1670 to 1790 most of the earlier buildings were swept away and replaced with what you can see today. 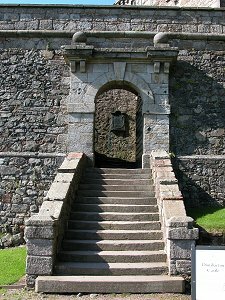 These were designed first to enable Dumbarton to provide a secure base for Government Troops during the Jacobite uprisings of 1689, 1715 and 1745. Later the primary concerns were to defend the River Clyde against French naval attack, and to accommodate French Prisoners. 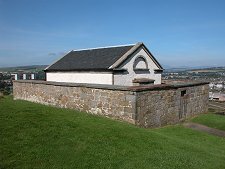 The Governor's House and King George's Battery that dominate the Clyde side of the rock were built in 1735. In 1795 the North Gate facing the town was blocked and replaced by the Duke of York's Battery. Of the various buildings also erected at the time in the cleft between the peaks, only the "French Prison" remains. 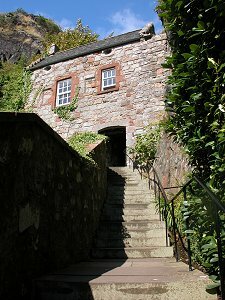 The other notable building today is the Magazine, built on The Beak in 1748 after earlier buildings had been demolished. This was designed to survive a direct hit by an artillery shell, an event that had largely destroyed Fort Augustus in February 1746. 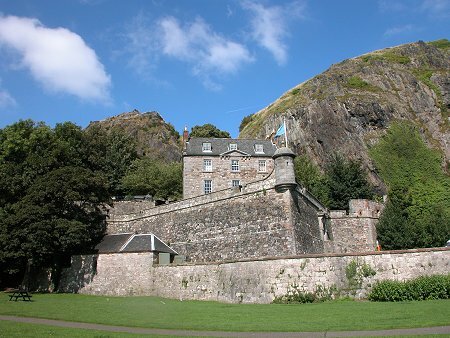 The military left Dumbarton Castle in 1865, which by then was already becoming a tourist attraction. The army took it over again in 1914, and in 1939, and the castle saw its last action in May 1941 when a German aircraft dropped four bombs on Dumbarton Rock during a raid on the Clyde. 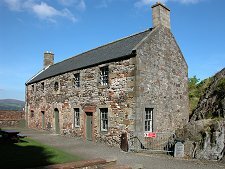 Today it is in the care of Historic Environment Scotland.